A measure of performance and dependability, Safety Integrity Level (SIL) ratings take into account on-demand failures and risk-reduction factors. WIKA’s SIL 3 certified multipoint thermocouple assembly ensures that users get the reliable temperature information they need, when they need it. Safety Integrity Level (SIL) calculations have become an important part of today’s instrumentation. The SIL rating of a system is a measure of its reliability: that a device will work properly when needed. The rating is calculated based on the Probability of Failure on Demand (PFD) and Risk Reduction Factor (RRF) values, established by the International Electrotechnical Commission (IEC). IEC 61508 and IEC61511 standards define those values for each of the SIL categories. The lower the number, the lower its dependability. For processes that use a thermocouple assembly, on-demand failure means losing the signal during periods when temperature measurements are essential for safe operations. In the case of a hydrocracking unit (HCU), for example, continuous temperature measuring is a requirement at startup, during operation, and through the shutdown sequence. Some problems, such as leaks around seals and welds, are serious. But because they do not cause a loss of signal, leaks are not considered on-demand failures. WIKA USA designed and manufactures the Gayesco Flex-R® (Model TC96-R) specifically for the refining and petrochemical industry. The instrument is SIL 3 Capable with an HFT (hardware fault tolerance) = 1. In other words, the thermocouple is rated SIL 3 when two sensors are used in conjunction, which equals one redundancy. Backing this impressive rating are more than 50,000 units with 8.6 billion total hours of service over the past 30-plus years. 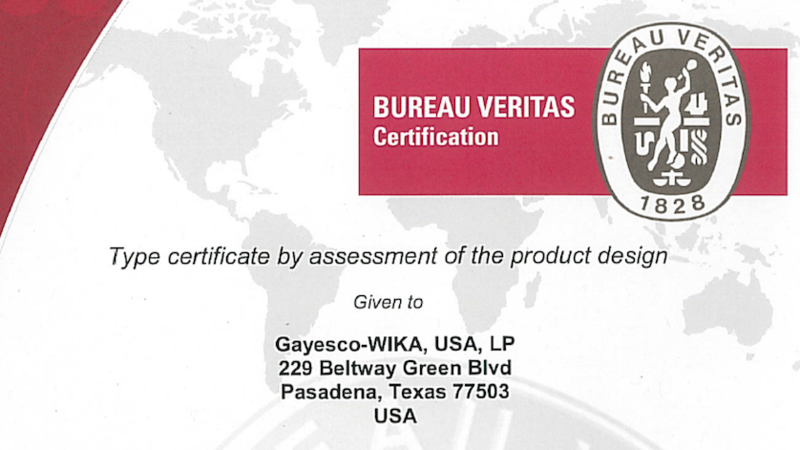 The certification was granted by the third-party certification agency Bureau Veritas; certificates and operations manuals are available upon request. Conductor wires with larger-than-normal cross section area are better able to resist the internal damages caused by grain growth and the differential expansion of the metals. Large conductors are harder to break and last longer than smaller ones. WIKA uses engineered cables that maximize conductor size for a given thermocouple’s outside diameter (OD). Gayesco Flex-R®’s 15- and 16-gauge wires for single thermocouples, and 18-gauge wires for dual thermocouples, are much bigger than the standard 20- to 22-gauge wires of typical thermocouples. Protecting each Gayesco Flex-R® thermocouple is an extra-heavy sheath with a wall thickness that exceeds industry norms. The heavy sheath shields the thermocouple from mechanical and catalyst damages that can occur during startup, operation, and shutdown of catalyst bed furnaces and other hydrotreating processes. WIKA does not use standard mineral insulated (MI) cables for Gayesco Flex-R® assemblies. Rather, the cables are made of an optimized, highly engineered MI material – typically, 321, 347, and other specialty metals. Off-demand failures are not included in SIL calculations. However, the attributes that merited an SIL 3 rating also improve reliability outside of startups, operations, and shutdowns. A thermocouple assembly is exposed to stresses during catalyst loading and uploading. In addition, the welding, grinding, and shearing during maintenance and repair also can hurt thermocouple sensors. Gayesco Flex-R®’s large conductor wires and thick sheathing prevent mechanical damage during these off-demand times. The heavy sheath also allows technicians to weld the thermocouple during construction and repair with little chance of damage. Thus, Gayesco Flex-R® thermocouples are repairable/replaceable in situ within a few hours – thereby minimizing downtimes and reduced labor costs. WIKA has more experience than any other company in designing thermocouples for the refining and petrochemical industry. The first Gayesco Flex-R® multipoint thermocouple assembly was installed in 1987. Some of them were still providing reliable service 25 years later. (For optimal performance, WIKA recommends a new install every 15–20 years.) Contact our experts to learn more about WIKA’s SIL 3 certified assemblies and how to minimize on-demand and off-demand failures.